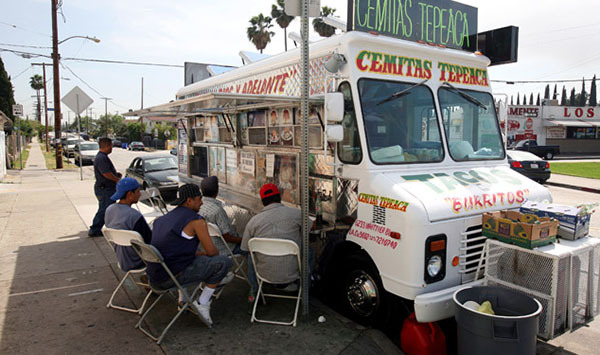 Loncheras, or stationary food trucks, are predominantly microenterprises owned and operated by Latino families in their own neighborhoods, contributing to their communities’ economic development by keeping profits local. Mostly serving low- and moderate-income areas lacking in adequate food options, these wheeled kitchens are not generally known for directly competing with brick-and-mortar restaurants. They do, on the other hand, provide pedestrians and transitdependent persons vital foodservices that they may not otherwise easily access. Most lonchera operators (also called “loncheros”) own a single food vehicle and employ mostly their own family members in the business, answering to their own employment needs while providing affordable, hearty meals to other working-class residents. While frequently called “taco trucks,” the typical lonchera serves an array of other dishes as well, frequently featuring a particular specialty—from a regional brand of string–cheese torta to spicy shrimp cocktails—and occasionally not serving tacos at all. Contrary to common perceptions, loncheros incur significant overhead. The monthly cost of a parking space at a commissary (where health regulations require that a food vehicle be stored and serviced every day) ranges between $800 and $1000 per month, rates comparable to commercial rents per square foot in Los Angeles. Capital-investment expenditures made by food-truck operators are also considerable, ranging from a minimum of $30,000 for a used kitchen-equipped vehicle to well over $100,000 for a new one. Moreover, loncheras are at the top of a food chain that includes many large and small suppliers throughout the Los Angeles providing meat, produce, tortillas, bread, paper products and beverages among other necessary inputs. These include mom-and-pop tortillerias, bakeries and produce stores located in the same communities as the food trucks, the commissaries, as well as such corporate wholesalers like Smart & Final, Restaurant Depot and Costco. Also in the lonchera supply network are the manufacturers, retailers and maintenance providers of the vehicles and kitchen equipment. This report examines the economic impact of loncheras, arguments for and against them, and policy recommendations regarding loncheras.